The recipes in this book are all based on the “Gracie diet,” a way of eating that originated with Carlos Gracie and has continued down the family line (to learn more about the diet, go here). To be honest, it doesn’t even really seem like a diet in the typical restrictive sense of the word. It’s just a way of eating that focuses on simplicity and health. And as far as celebrity diets go, I’d much rather have one that lets me cook lasagna, guacamole, hearty soups and sandwiches than one where I have to buy $60 tubs of dubiously named powder (Gwyneth Paltrow, I’m looking at you). 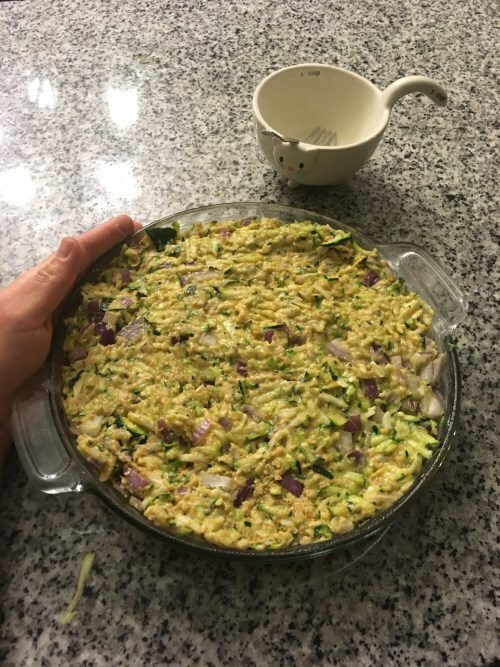 The first recipe I made was for Zucchini Slice. I picked it because I’m a fan of zucchini in baked goods. Also, I just loved the name. Slice sounds adorably quaint to me, like something you’d order at a diner or your grandma would serve up at a family gathering. 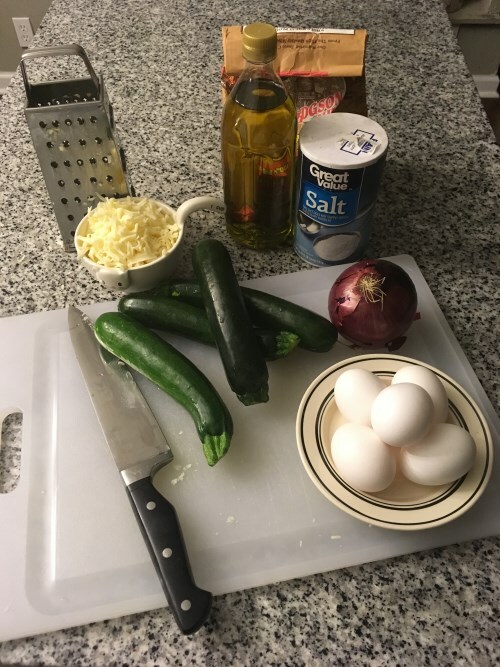 The recipe has simple ingredients: three zucchini (I used four because the ones I found were tiny), one small red onion, five eggs, a cup of self-rising flour, a half-cup olive oil, one cup grated Monterey Jack cheese, and a teaspoon salt. Himalayan sea salt, specifically, but I scraped some of the de-icing kind off my neighbor’s sidewalk. Ha ha, no, I’m joking. But I did just use regular table salt. 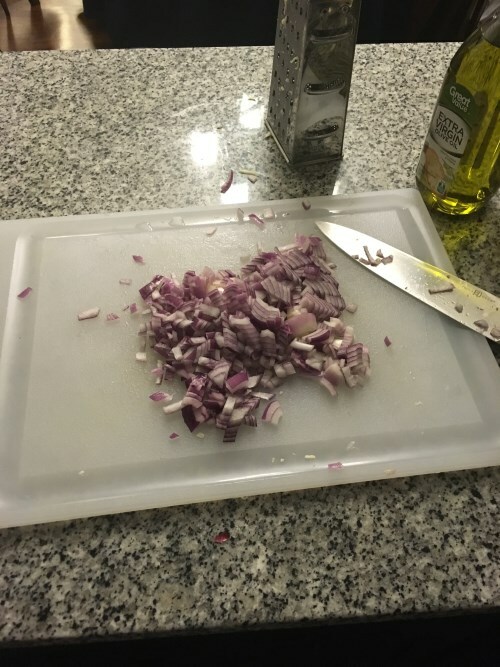 The first step was to cut up the onion into fine pieces. Easy enough! Fun fact about me: I don’t cry when cutting onions. Never have. I did once cry when cutting an apple, but that was because the stupid knife slipped and went up under my thumbnail. 0/10 experience, would not recommend. Next, I had to grate the zucchini. 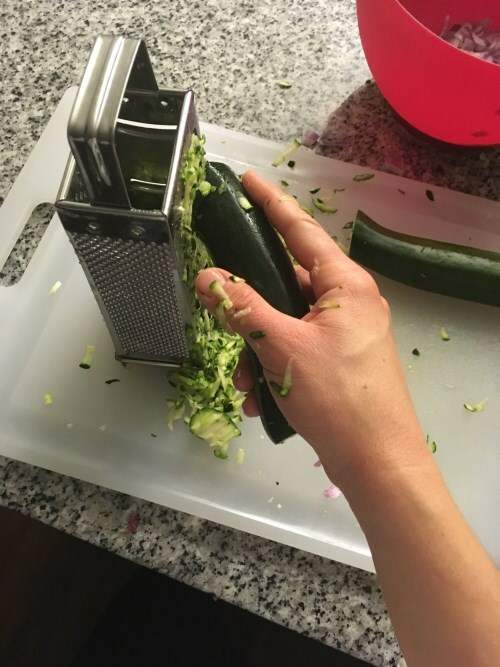 I just used a cheese grater, but a food processor with a grating attachment would work too. However, if you make this recipe, you do need to grate it. Chopping it, even into small pieces, is not the same thing. Once I had a nice pile of grated zucc, I had to remove the excess moisture. Angela says to pat the zucchini dry. But like I mentioned, I’ve baked with zucchini before, and trust me, you really want to wring the liquid out of it. So I balled up my zucchini pile and bundled it into a layer of paper towels, then went to town, squishing it like I was Khan in Star Trek: Into Darkness and the zucchini should have just let me sleep (cool people get this reference. Trust me.). Side note: If you’re inclined, as I was, to taste the zucc juice, resist the urge. I like zucchini, I really do, but this tastes like dirt that has had zucchini rubbed on it. Now, the zucchini doesn’t have to be completely dry. You’re not going to get it completely dry without trying way, way too hard. But violently squeezing it seemed to work well, plus I think it helped with my grip strength for BJJ. I dumped the zucchini into the bowl with the onion. In a separate bowl, I mixed the olive oil, eggs, and shredded cheese (I used a little extra because cheese). Once those were mixed in, I added the vegetables and stirred them in, making sure there were no huge clumps of zucchini sticking together. It was around this time that I realized I’d goofed up. The original recipe calls for self-rising flour. After getting back from the grocery store, I realized that not only did I not have self-rising flour, I didn’t even have regular white flour. What was in the pantry was something called “white wheat flour.” It had a texture somewhere between white and wheat and was kind of dense, which I was worried that it would affect the texture. The picture in the book of the slice (love that name) looked so lovely and light and fluffy! I didn’t want to ruin that, but I also didn’t want to go back to the store. So I looked online and found that you can fake self-rising flour by adding baking powder. I tossed some into the white-wheat flour and called it good. That got stirred into the wet ingredients, then the whole mix went into a pie pan and into the oven at 325 degrees. I wish I was one of those people who has their life together and cleans their kitchen while waiting for their food to cook, but I am not. But I wasn’t totally unproductive! I started to write this blog instead of just napping on the couch, so that’s something. I gave the slice 35 minutes (the recipe calls for 30 to 40). It was almost painful to wait when it smelled so good, but I did. Finally it came out of the over, and I cut myself a nice piping hot slice. This is it. The actual First Slice. I paused to take a picture of it because that’s just how much I care about you, dear reader. And holy guacamole, the Zucchini Slice is delicious. The olive oil, flour and eggs form a kind of crust, except it’s spread throughout the slice so you get some in every bite. 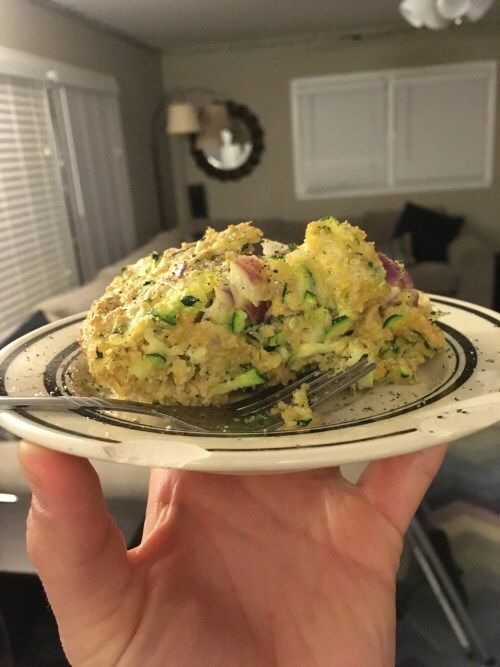 The zucchini is soft and tender but, thanks to the vigorous liquid-removal squishing, not soggy; the onion pieces stay firmer for a nice crisp crunch. The flavor is savory but simple, and lends itself well to alternate seasonings. I tried sprinkling on a few different spice combinations, but there’s no reason they couldn’t also be baked in. Oregano and basil, paprika and cayenne, and crushed red pepper flakes are all good. White cheeses are a big thing in the Gracie diet, so I won’t violate that by recommending cheddar cheese, but mozzarella, Gouda, or parmesan would also go great. One thing I would not change, and you shouldn’t either, is the oil. The olive oil flavor comes out perfectly, especially in the crust-heavy bites. Don’t be tempted to sub in canola oil. It will not be as good. 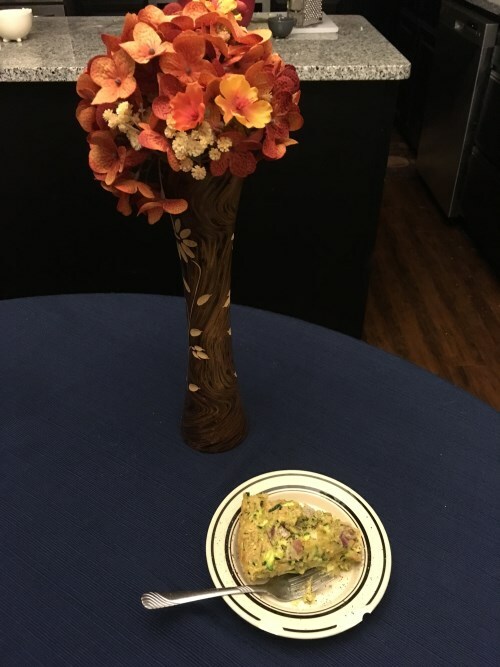 Zucchini Slice is also a versatile dish. 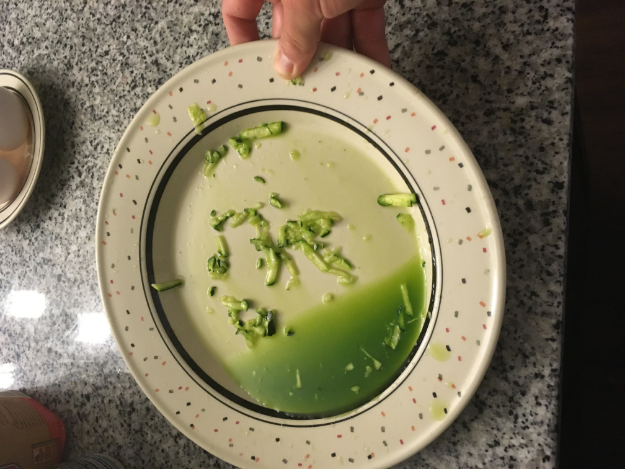 It can be eaten as a full meal (I ate about a third of it straight out of the over. Don’t judge me. I was hungry), or as a side dish with some salad, and it works at any time of the day. I reheated some for breakfast the next morning, and, even later, reheated some that I’d frozen, and it was still just good. I definitely look forward to trying more of these recipes in the future! In the meanwhile, I’m going to hold on to the recipe for Zucchini Slice. If you make it, with or without any modifications, let me know! I’m curious to see what other people think of this great recipe.